A subdirectory named whois will be created and selected for XL-Whois reports. Check for update of the tool at startup. A XL-Whois.ini configuration file will also be created to keep your preferences in memory. You can also set elements above manually, in case you already have some of these databases. At the end, you will be asked if you want to send a whois test. Domain whois for domain names registration details. 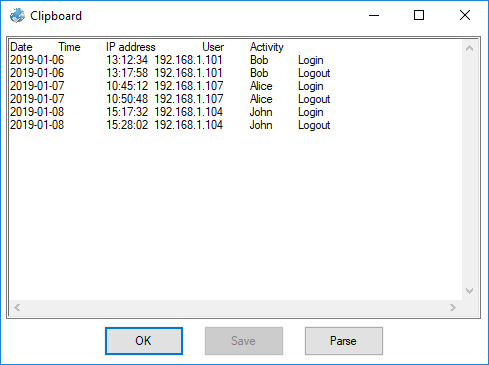 Network whois for IP addresses. DNS Records which is about the Domain name. To be able to send a Domain whois about an IP address or to be able to send a Network whois about a Domain name, XL-Whois use system nsLookup to resolve the requested item. Registry: This option may be used if you want to force the network whois to be queried to the selected registry. The IPv4 Database (ipv4-address-space.csv) from IANA contains "errors" that affect whois tools. For example, 163/8 is supposed to be administered by APNIC, but 163.247/16 is administered by LACNIC. So, in this case, you will get a better answer if you force the registry to LACNIC. Don't check: XL-Whois will send he request without checking the database. If an entry already exists, it will be replaced. If present, ask: XL-Whois will check the Whois Database before sending the request. 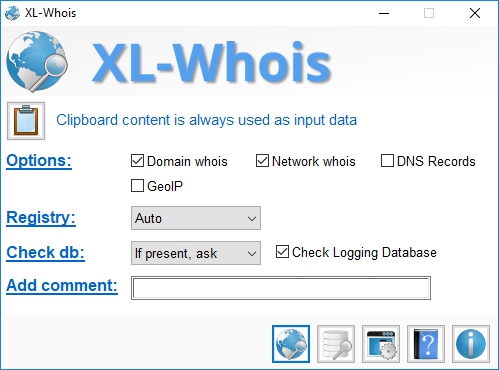 If an ISP is already known for the requested IP address (or resolved for the requested host or domain name), XL-Whois will show you actual data and ask you if you want to send the request. If present, ignore: XL-Whois will check the Whois Database before sending the request. If an ISP is already known for the requested IP address (or resolved for the requested host or domain name), XL-Whois will ignore the request. 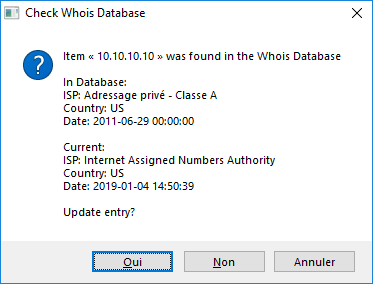 As the whois database is updated after each request, this option is particularly useful if you have a long list of IP addresses and a probability that many of them will be in the same range, like a login history. Logging Database: History of your precedent requests. This database contains the exact items you requested, the comment you add, etc. This database is your personal history. 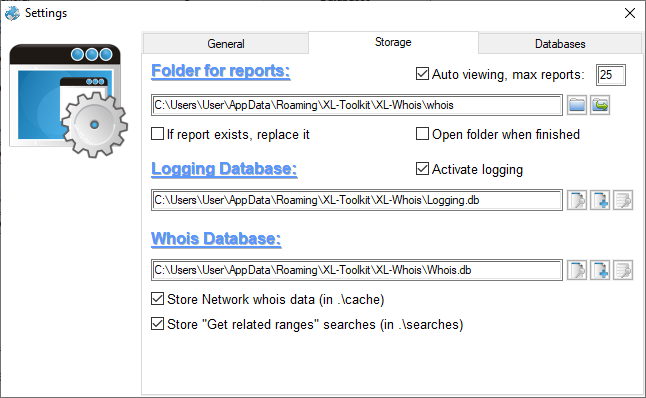 See Logging Database section for more details. 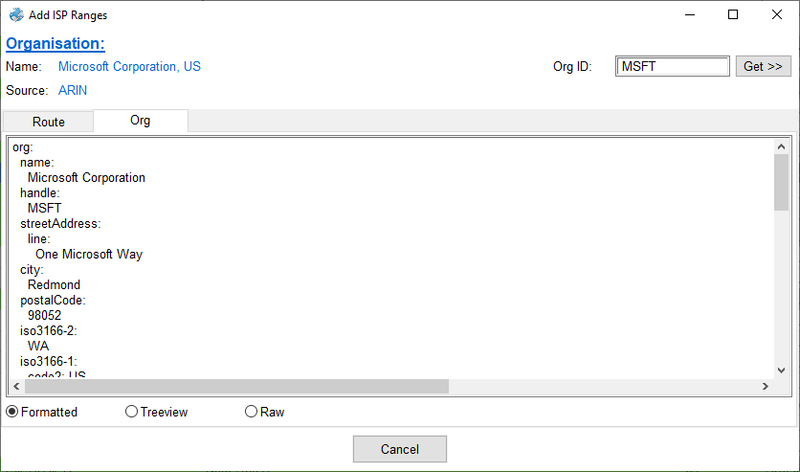 When you select this option, the item will be searched in Details and Comment column of the database. If more than three entries are found, only the three most recent results will be shown. In the tray Whois function, only the first item is displayed. If there are more than one item, a 3-dot (...) is added at the end as the example above. 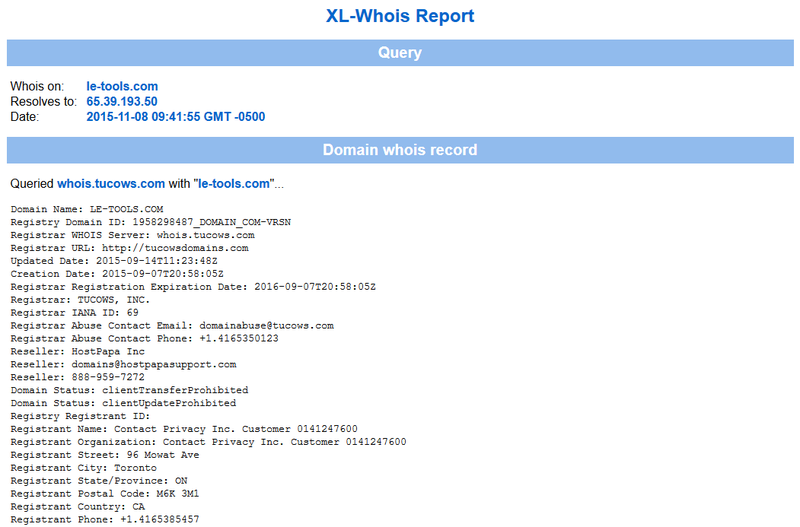 For Domain whois, XL-Whois will check in the TLD Database to extract and valid the domain name (ex. : file.txt has a valid syntax but is not a valid domain name). After that, it will check in the Whois Server Database to identify the appropriate whois server for the query. If no whois server can't be found, a request is sent to Internic to identify the appropriate server. You must also be aware that, like many other whois tools, XL-Whois use the WHOIS protocol to send the request to an appropriate server listening on port 43. Some ccTLDs doesn't have this kind of server. In this case, you will have to check on the Website of these ccTLDs. For some of them, it's possible to send a http query. Examples of ccTLD that doesn't support whois request are .ar (Argentina), .pk (Pakistan) and .es (Spain). 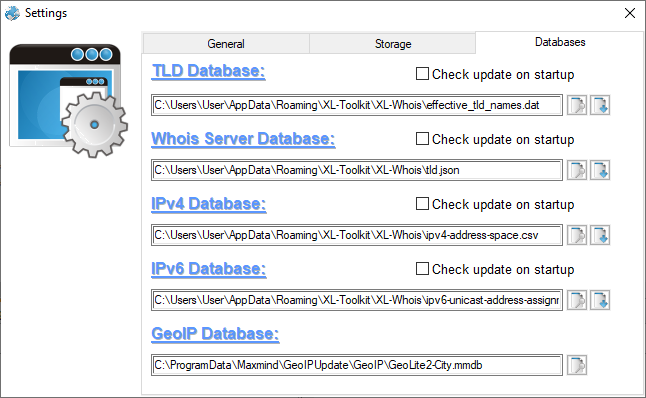 For Network whois, XL-Whois will check in the IPv4 Database or the IPv6 Database to find the correct registry for the IP address. If no match is found, ARIN is used by default. The first request is sent to this registry. If the answer indicates another registry, a second request is sent to this registry. When XL-Whois gets the final response, it parses the response to extract information about the ISP. For DNS Records, XL-Whois will query each NS server for A, AAAA, NS, MX, CNAME, TXT, SOA and PTR records. 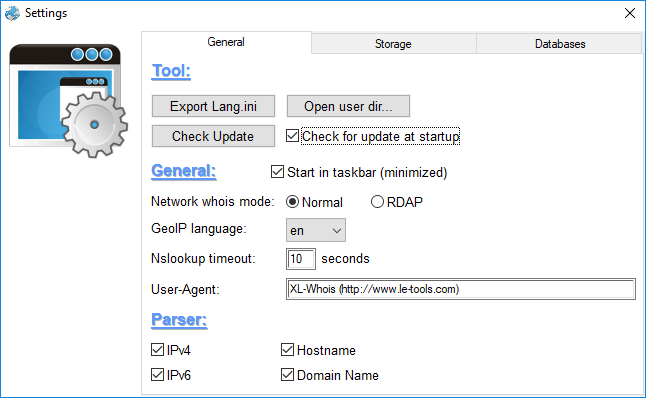 Export Lang.ini: Use this function to translate XL-Whois GUI. See Translation for help about this functionality. Open user dir: This is the directory where all user databases and settings are saved. Copy the content of this directory if you want to backup your settings. Check Update: Check on le-tools.com if a tool update is available. Check for update at startup: Check if an update is available everytime XL-Whois is started. Choose to start XL-Whois in the taskbar (main window minimized). Network whois mode: By default, XL-Whois use the WHOIS protocol and send the request to the appropriate registry server on port 43. Some firewall rules on client side may block outbound connection to this port. RDAP is a relatively new protocol that use HTTP protocol on port 80 (See RFC for more details). As HTTP traffic is usually allowed by firewall, it could be a good alternative for users that can't use port 43. The support for RDAP in XL-Whois is experimental for the moment. It applies to Network whois only, but this may change in the future. Network whois report should be a bit different if you use RDAP. 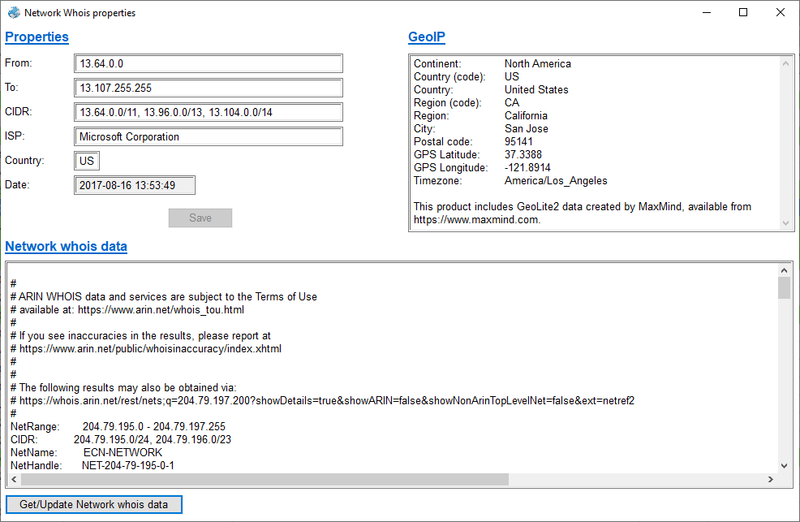 GeoIP language: The GeoIP2 database from Maxmind provides data in different language. You can set your preferred language here. Set the NsLookup timeout: When XL-Whois tries to resolve a hostname to an IP address or an IP address to a hostname, this is the time it will wait for the answer. Default is 10 seconds. Customize the User-Agent of XL-Whois: The User-Agent is used to identify the tool when requesting databases from websites. In Parser section, you can select or deselect objects to be extracted by XL-Whois. Objects are: IPv4, IPv6, Hostname and Domain name. Folder for reports: This is the folder where the whois reports will be saved. Auto viewing: This option is used to open whois reports in browser (or the default program for .html file) as it go along. 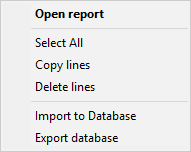 If number of reports is higher than the limit, reports will not be automatically open even if the option is selected. If report exists, replace it: If selected, older report with the same name will be replaced. If unchecked, an incremental value will be added to the new report filename. Open folder when finished: If selected, report folder will be opened in explorer at the end of the process. Logging database: This database is required only if you want to activate logging. See Logging Database section for more details. Whois database: The Whois Database is the main database where Network whois data will be saved. See Whois Database section for more details. Store Network whois data: If this option is checked, XL-Whois will use a cache to store the whole Network whois response. The information will be available in the Whois Database window. The cache is in a subfolder (.\cache) of the directory where the Whois database is. Store "Get related ranges" searches: If this option is checked, XL-Whois will keep a copy of all responses obtained when you use the Get all related ranges function. The cache is in a subfolder (.\searches) of the directory where the Whois database is. TLD Database: This database is the Public Suffix List that come from https://publicsuffix.org. It's used by the parser of XL-Whois to identify valid domain name. This database must be regularly updated to support new or modified TLDs. Link to the database is https://publicsuffix.org/list/effective_tld_names.dat (or https://publicsuffix.org/list/public_suffix_list.dat). Whois Server Database: This database come from https://github.com/weppos (whois repository). It's used by XL-Whois to identify the appropriate server for the Domain whois request. Link for the database is https://github.com/weppos/whois/blob/master/data/tld.json. IPv4 Database: This database is the "IANA IPv4 Address Space Registry" that come from http://www.iana.org. It's used by XL-Whois to identify the registry for IPv4 addresses (ARIN, RIPE, APNIC, LACNIC, Afrinic). Link to the database is http://www.iana.org/assignments/ipv4-address-space/ipv4-address-space.xhtml. IPv6 Database: This database is the "IPv6 Global Unicast Address Assignments" that come from http://www.iana.org. It's used by XL-Whois to identify the registry for IPv6 addresses (ARIN, RIPE, APNIC, LACNIC, Afrinic). Link to the database is http://www.iana.org/assignments/ipv6-unicast-address-assignments/ipv6-unicast-address-assignments.xhtml. GeoIP Database: This database is the GeoLite City that comes from Maxmind. This database should be regularly updated. Direct link to the database is https://geolite.maxmind.com/download/geoip/database/GeoLite2-City.tar.gz. Export Database: Export the SQLite Database data to a text file. This file can be imported in another instance of XL-Whois. Import to Database: The input file must have been created by the Export Database function. Unknown ISPs will be added and known ISPs will be modified if newer. Extract whois info from a file: Network whois answer (raw format) is the same whatever the whois tool that has been used. This function uses the same parser as XL-Whois calls when it receives an answer from a whois request. Network whois data will be added to the Database if unknown, or modified if newer. 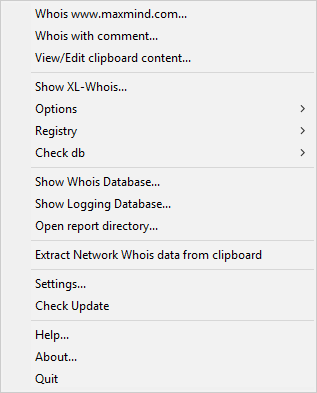 You can also extract Network whois data from clipboard. 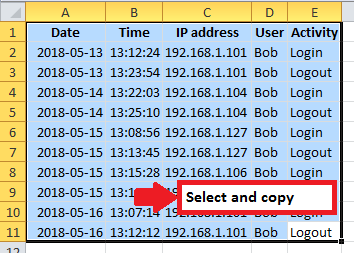 You must select the Network whois data and and use copy to send data to clipboard. Then, you can use the appropriate function in the XL-Whois tray menu. Search: With this functionnality, you can search an IP address or a keyword. For IP address, it's based on IP range. For keyword, it looks at the ISP column. Filters can also be set when right-clicking on a cell of the grid. See in the next section. Click: Clicking on header of each column is used to sort (ascending or descending) in alphanumeric order. Clicking on any other row will select the line. You can select multiple lines using SHIFT or CTRL like you do with other tools. You can edit properties from this window. 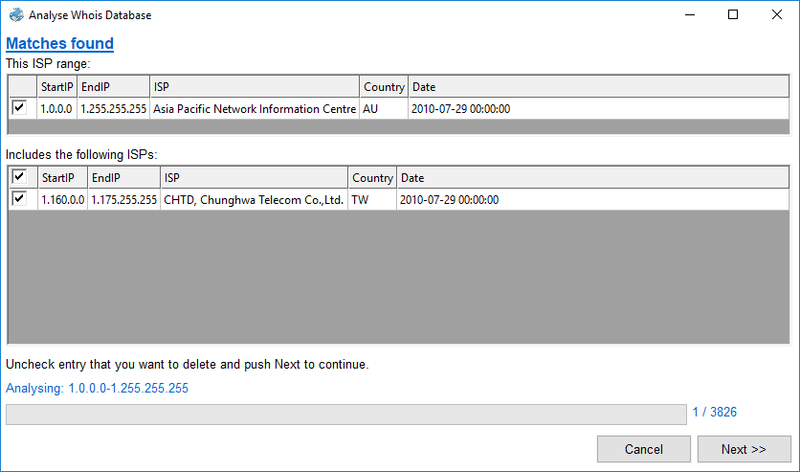 You can also get or update network whois data. Properties: Default. Same effect as doucle-clicking. Add ISP: Show an emty Network Whois Properties window where you can add an entry manually. Filter: You can apply filter (equal or not equal) using the selected cell value. 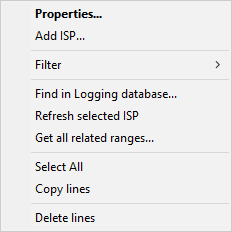 Refresh selected ISP: This function will send a whois request for each selected range to update the ISP data (it uses the first IP address of the range). If the response does not match the range in the database, the new range will be added, but the old one will not be deleted. You must do it by yourself if you are pretty sure that it does not exist anymore. You can try to get/update the network whois data or use the Get all related ranges function. Get all related ranges: The goal of this function is to get all IP ranges related to an ISP. Be aware that the related ranges are based on the ASN (originAS, aut-num, origin) or on an organisation/administrative id (orgRef, ownerid, admin-c). The first view will show results about the route, the organisation or the AS (Autonomous System). You can show and select all ranges, parent only or small only (more specific ranges). 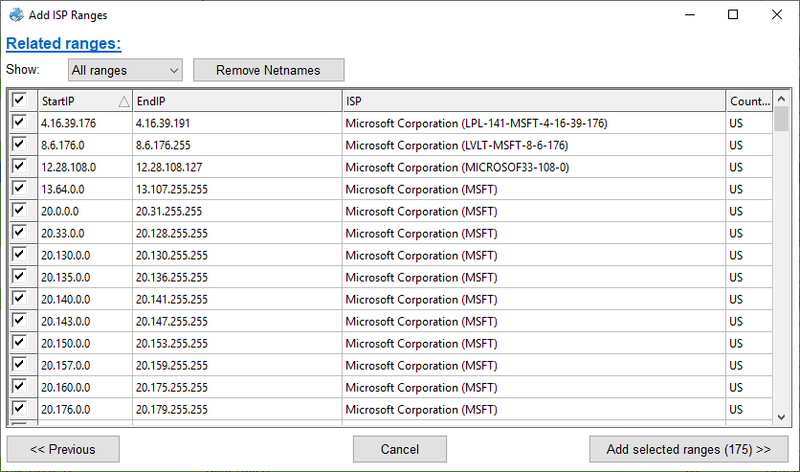 By default, netname is added to the ISP name of each range, but you can remove it using the Remove Netname button. 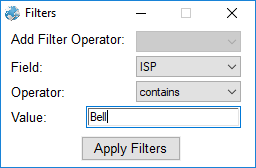 In some cases, ISP name can be choose from a list. Select All: Select all the line in the grid (CTRL+A can also be used). 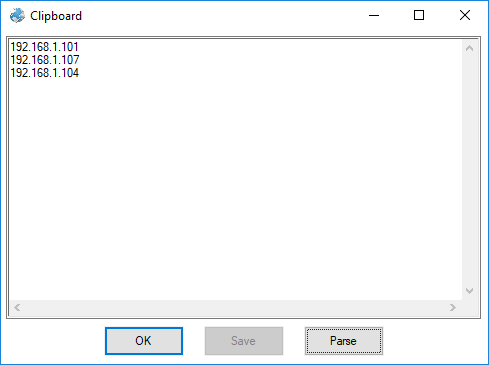 Copy lines: Copy selected lines to clipboard. Header is always added to the selection. This allows you to easily copy your database in a spreadsheet or as text. Delete lines: Delete selected lines. If you activated logging in the Config Window, everytime you use XL-Whois and send a whois request, an entry is added to this database. 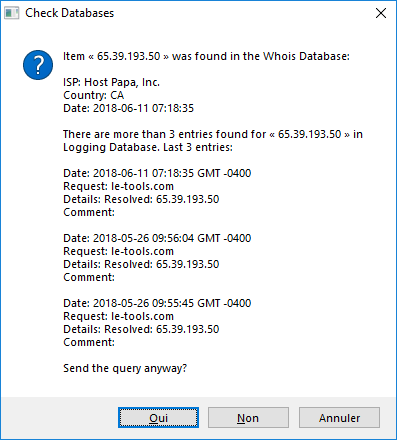 The entry contains date and time of the request, the requested item, the resolved hostname or IP address (if lookup has been used and a match was found) and a comment that you provide. This database will be checked before each whois request if you set this option. Logging Database can be opened in the Storage Tab of the Config Window or from the tray menu. Data from this database can also be imported or exported (right-click on any element in the grid). The Comment column is editable. 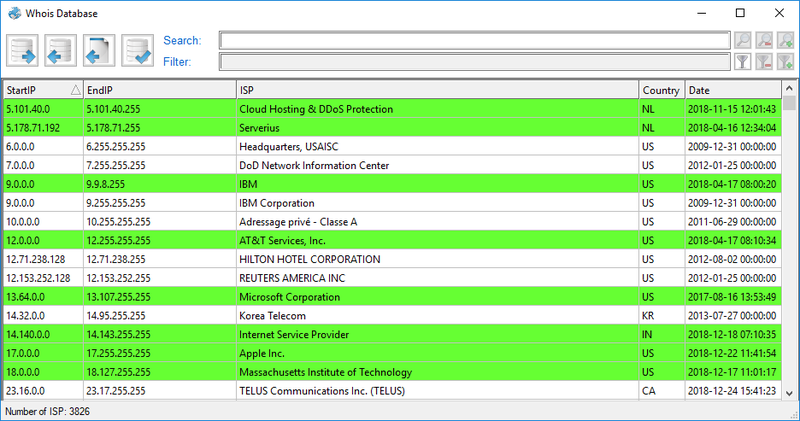 Double-click: If it's a green background line, it means that the whois report is available. When double-clicking on a line, the report will be opened in your default browser. Open report: Default. Same effect as doucle-clicking. Import to database: The input file must have been created by the Export Database function.